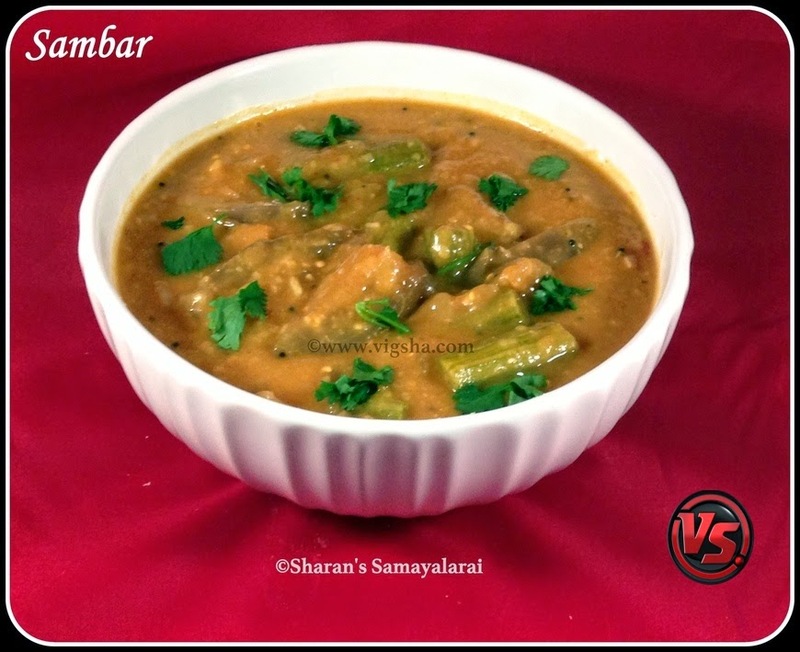 Sambar is a very popular and aromatic South Indian gravy. There are so many versions in preparing Sambar depending on the veggie used. Today, I am going to share the basic version. This is my mom's recipe and its my all time favorite. Check the other sambar versions which I have already posted. Preparation method differs in each version - Beetroot Sambar, Keerai(Spinach) Sambar, Radish Sambar, Mango Sambar. 1). Cook the toor dal with castor oil (1tsp), turmeric powder and water in a pressure cooker until it's soft. Once the pressure releases, mash the dal with a laddle. Extract juice from tamarind and discard the pulp. Chop the veggies and keep it aside. 2). Heat oil in a pan and add mustard. When it splutters, add onions, asafoetida, curry leaves, salt and saute till onions turns translucent. Then add tomatoes and saute till it becomes soft. 3). Add the chopped veggies along with tamarind extract, sambar powder, chilli powder and bring it boil. Let it boil until the sides become frothy and the veggie becomes soft. 4). Then add the mashed dal, grated coconut and bring it to a boil. If the sambar is too thick, add more water. When it boils briskly, switch off the flame and garnish with chopped coriander leaves. Serve with steamed rice and poriyal (stir-fry). # Shallots makes the sambar more flavorful. # Sambar gets slightly thick when cooled down, so switch off the flame accordingly.